One of the leading female jockeys in the racing world at the moment made history at Kempton on Monday by being the second ever woman jockey to ride out her claim over jumps in Britain. She went on to win the Class 3 Handicap Chase over 2 miles 4 1/2 furlongs on board Marienstar for trainer Neil King and gain her 75th win of her career to make her a professional jockey. The 23 year old comes from an esteemed racing back ground with her father, Jimmy Frost who won the Grand National back in 1989 and is now a trainer and her racing manager is Mick Fitzgerald who also had a unbelievable career as a jockey winning most of the big jumps races around like the Gold Cup and the Grand National. Frost has many brilliant victories to her name within the 75 wins during her career with the top accolades being her Grade 1 victory with Black Corton, The Old Roan Chase victory last month on board the Paul Nicholls trained Frodon and Her most recent back to back victories in the Badger Ales Trophy in the saddle of Present Man that came on Saturday. (Credit Racing Post) The female jockey said: "Crikey, I'm a professional now, I've flown the nest and I'm not quite sure what to think. "It's now a bit of a daunting time but I've got a great team behind me and Paul [Nicholls] and Neil fill me with a lot of confidence." The now Professional jockey with have a three day cooling off period where after that her claim will officially be gone and she will not able to claim anymore. (Credit Racing Post) The jockey added: "Kempton has a great place in my heart. "I've had some of the best days of my life here, with Black Corton's big victory being the highlight. I'm still just a little person and really have to pinch myself." 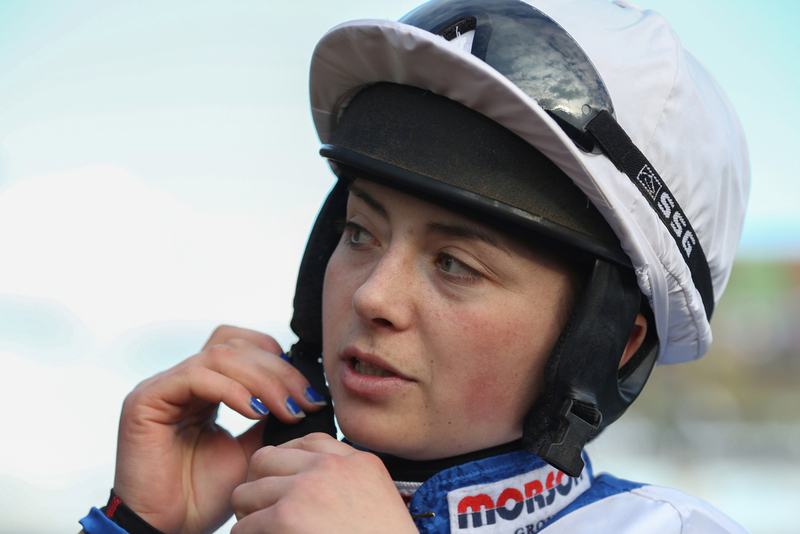 Bryony Frost joins Lucy Alexander who was champion conditional jockey in the 2012-13 season and Rachael Green, who has not ridden for a few year, to be the only three women jumps jockeys to land 75 winners being based in Britain.